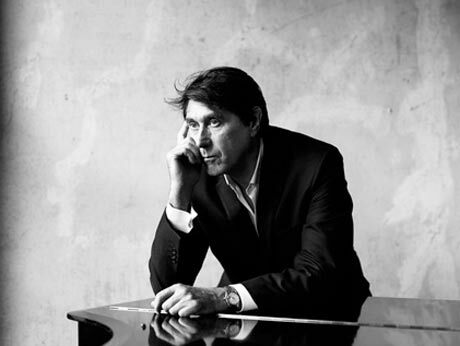 Former Roxy Music frontman Bryan Ferry is a living legend, but there's no denying that he's slowed his output in recent years. His last few albums have been made up primarily of covers, including his 2007 collection of Bob Dylan songs, Dylanesque. Now, Ferry is preparing to roll out his first set of originals since 2002's Frantic, announcing that new album Olympia will be out on October 26 in North America via Astralwerks and a day earlier in the UK via Virgin. As previously reported, the new release is a guest-heavy endeavour featuring Jonny Greenwood of Radiohead, Flea of Red Hot Chili Peppers and David Gilmour of Pink Floyd. Scissor Sisters also make an appearance, along with Primal Scream/Stone Roses bassist Mani and Chic's Nile Rodgers. Most exciting of all for Roxy Music fans is the fact that the album features Brian Eno, Phil Manzanera and Andy Mackay, who all last appeared alongside Ferry on his 1994 effort, Mamouna. The album doesn't entirely abandon Ferry's love of cover songs though, including versions of TIm Buckley's "Song to the Siren" and Traffic's "No Face, No Name, No Number." There's also a reworking of Groove Armada's "Shameless," which was originally released earlier this year featuring guest vocals from Ferry. So far there is no word on a North American release date. 6. "Song to the Siren"
7. "No Face, No Name, No Number"
8. "BF Bass (Ode to Olympia)"
10. "Tender Is the Night"